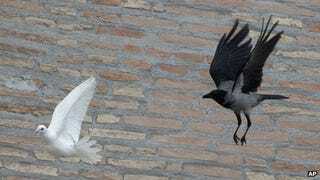 The Pope's children released two doves of peace today to celebrate something or other. The doves were attacked by a crow and a seagull. The fate of the doves is unknown. The ancient Etruscan practice of the augures or auspices was continued as the most popular omen-reading of the Roman Kingdom/Republic/Empire. The flight of birds would foretell what would happen in Rome. As the Pontifex was the post held by the Emperors and Constantine set up the Church and invented the Catholic Christ, the Catholic Church is clearly the Roman Empire continued by other means. It is therefore clear to me that the Vatican will be invaded by foreign navies and armies this year. Perhaps as part of a United Nations intervention.